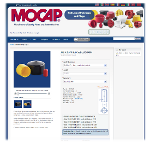 MOCAP has launch a newly redesigned website. This new site features a new layout, new menu structure, and a new webstore which features an "Item Customizer". Our new Item Customizer puts you in complete control of our production process. Create a customized vinyl product in virtually any length, width and material color you need, and order it instantly online! If you have any other questions, you may Contact MOCAP by email, phone or through our new online chat system (Available during regular business hours, M-F 8am-5pm Central Time).